The Petite Griffon is the tiny, noticeable spire lodged between Mt. Abbot and Mt. Mills that is just begging to be climbed. The approach is long for three pitches of climbing, but the scenery is gorgeous, the feature unique, and the summit memorable. In the spring, it makes an interesting adventure to ski the approach out to the spire. Another route that heads up the prominent zig-zag crack on the north side of the spire was put up by Andy Selters and John Moynier in the nineties and goes at 5.9. 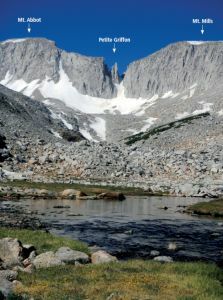 The Petite Griffon actually has two summits, with the western summit being the true summit. This fun, easy route starts on the northwest side, and spirals up the southeast face, where an airy 5.7 move gains the western summit. Good luck trying to climb the eastern summit, it looks like an exposed, unprotected slab. An ice axe and crampons are highly recommended for the approach up the couloir, as it is 40˚ steep, 1,000 feet long, and holds snow even in low snow years. Which SuperTopo guidebooks include a topo for Southeast Face? Overview of the Petite Griffon and surrounding peaks.